I’m going to honest with you, I’ve never been a fan of soya products. It may be because of my varsity days when a quick meal for dinner on the days that I was vegetarian meant a couple of soya hotdogs in the frying pan, tomato sauce and bread. Not the most imaginative or inspiring dish at all. So, believe me then when I say that I have been converted! A week ago I attended the Fry’s Family event hosted by Chef Jacqui Brown at The Ginja Kitchen Studio in Durban North. The event turned my idea of Fry’s food on it’s head when we were welcomed with amazing appetizers that left everyone saying mmmm after every bite, and marveling at the fact that they were all vegan. After brief introductions,a bit of mingling and being informed that we would be doing the cooking ( surprise! ), we all headed into the kitchen space. The kitchen is any foodie’s dream space, with steel tables, top of the line gas ovens and a wall full of all the gadgets you could want or need to use. With the wine flowing, help from the chefs and a little humour from The Fry’s Guy, we split into groups of 3 and got cooking. 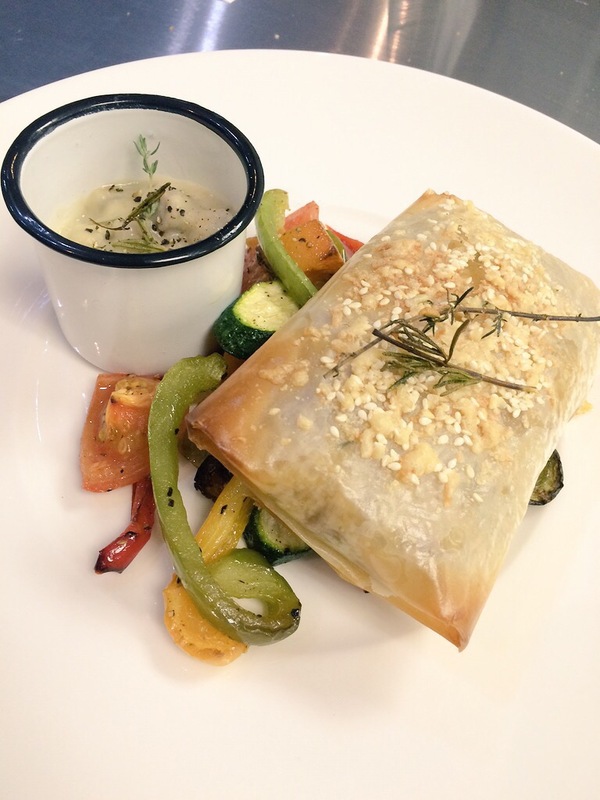 On the menu was Fry’s Schnitzel and Creamy Mushroom Parcels with Mediterranean Vegetables. I have to say that the recipe is so easy to follow. Between the Instagramming, Tweeting and selfies, we managed to put up what was a pretty delicious meal. If you’ve been living under a rock or in a carnivorous haze and have no idea about Fry’s Family Food, allow me to enlighten you. Their tagline, ‘ Its not just what we put into our food that makes it good, its what we leave out ‘ say it all. Fry’s products are free of MSG, Preservatives, Artificial Colourants, Cholesterol, Trans Fats, Hormones and Antibiotics. Their products are made from grains and legume and contain all 8 essential amino acids, making them a complete protein.This family owned company has 27 vegan products that are in stores in 20 different countries around the world. I think that they must be doing something right, don’t you?. Fry’s is running a competition. Simply buy any box of Fry’s and SMS the word Frys and the last four digits on their barcode to 33711 ( e.g. Frys1256). Entrants will be entered into a weekly lucky draw to win a feast with a gourmet chef for themselves and nine friends at the Ginja Kitchen Studio worth R5000. The competition runs from the 15th of February 2015 at 7am to the 15th of May 2015 at 12pm so don’t miss out! The evening was topped off with a delicious Litchi and Gin sorbet courtesy of the Chef and we were each given a little goodie bag to take home with us. Thank you to Fry’s Family and Chef Jacqui Brown for an amazing evening. It was great fun and definitely good food with good company. The Dirty Fork Studio (Ginja Kitchen Studio) is a great venue in Durban and hosts many other foodie events from cooking classes to exclusive chef’s tables, and will soon be the venue for my Macaron Classes. Visit the Dirty Fork Studio website for more information. Add a small amount of the paste at a time, this will make the sauce thicken. Cook until you have a lovely mushroom flavour, it should not be floury. Place the phyllo on a flat, clean surface and brush with melted butter. Cut into large squares. Place the schnitzel on the pastry and top with the mushroom sauce, then fold the pastry into parcels. Place the parcel on a baking tray lines with baking paper and bake for +- 20minutes until golden brown. For Vegetables: Chop and Cube all ingredients, place on a baking tray. Drizzle with olive oil and season with salt and pepper. Bake for 30 minutes.